Based on the February 2019 horoscope for Cancer, this year is all about you improving yourself and focusing on what the future has to offer. You have gone through a lot over the past years, but this one will be a blessing for you. The Cancer zodiac sign loves hobbies and this month is when you will have to pick them up if you had let them go at some point. As per the Cancer horoscope for 2019, you may be looking for happiness this month, but your marriage life will face some difficulties this month. Therefore any decisions you need make as regards your relationship with your spouse should be highly scrutinized because a wrong decision may end up spoiling everything. The Cancer star sign is not thinking of Cancer children at this time hence chances of pregnancy are nil unless you and your partner change your minds. According to the Cancer February 2019 horoscope predictions, there will be a lot of disagreements among family members because of the decisions you are likely to make. You are after pursuing that which makes you happy without putting your family into consideration. Trying new things is not a problem, but you have to indulge your family in decision making so that they can help you out. 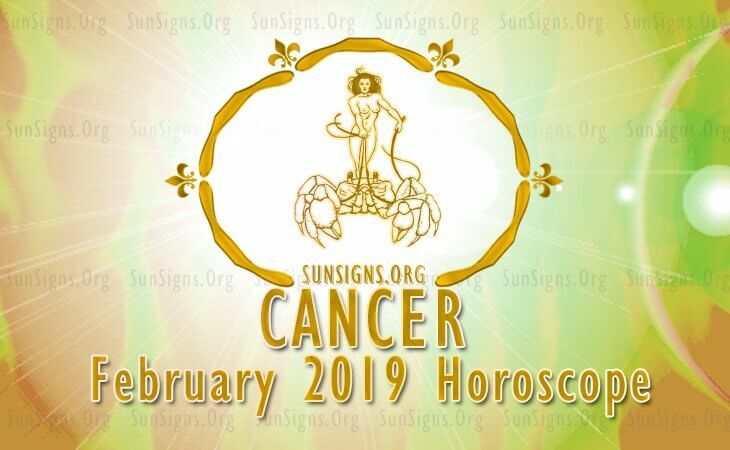 The 2019 horoscope for Cancer predicts that your health will be superb throughout the month without any complications but all the same you need to take good care of yourself for your good. The Cancer career horoscope for February 2019 foretells that you are a free spirit who is ready to explore any other career opportunities that are out there. Your career development is good this month, but you are willing to try out something new to add to what you already have going on. Based on the February 2019 horoscope, your financial prospects are facing a few difficulties due to the choices you have made in the past few months. Entering into new investments is not bad, but you need to plan your finances in such a way that you do not waste money on things that may not bring you any profit or gain. Based on the monthly astrology Cancer 2019, education will be a hard nut to crack this month. You are being taught new things that you are finding hard to grasp. The Cancer star sign should go out of his or her way to get outside help that will help him, or she understand and grasp that which is being taught. The Cancer horoscope for February 2019 reveals that you will travel a lot in this month in such of new job opportunities. You will also go to new places as a hobby since you are picking up hobbies that you had abandoned sometime in the past. You may refer to Love horoscope 2019.